This is the talk page for the article "Airbending". This space is for discussing changes to the article. Discussion on changing an infobox image or profile quote takes place on the appropriate project page for each. General discussion about the subject belongs to the comments, forum, or blog posts. Please remember to stay civil and sign all of your comments with four tildes (~~~~). This article is currently rated Featured and A-class on the Avatar Wiki grading system. didn't an interveiw with the creater say that there where more airbenders that escaped? Please do not edit this discussion. Soundbending would both be sweet and make sense. However, as it is, Airbending is in my opinion the weakest of all elements. Can I just ask a question? What exactly defines an 'alternate style' and how does it differ from a 'special technique'? I'm kinda new to this website but on wikipedia it mentions that the special techniques for Water, Earth, Fire and Airbending are healing/bloodbending/plantbending, sand/metalbending/earth-sight, lightening/blue fire and flying/air-scooter respectively. But on avatar wiki, you guys call all of those except flying and the air-scooter 'alternate styles' . Maybe airbending does have an 'alternate style' then and the seperation of 'special techniques' and 'alternate style' was a big mistake. Your thoughts? - Aangstaff. Now that's more like it. Welcome to the club. Anyways Plantbending and Bloodbending require an extremely high level of skill in order to execute them due to the delicacy required to not kill the organism by extracting the water accidentally. As such they are special techniques, like Toph's Metalbending. That and the show has categorised them as special techniques. He meant to say Hue and mixed it up with Yue. Anyways. The techniques can still be categorized as special techniques due to their rarity of use and abilities. That's why. One gains the title of Airbending Master and the tatoos that go along with it when he/she masters the 36 tiers of Airbending and invents a new Airbending Move. Aang was the exception to this rule since he gained his title and arrows while only mastering 35 tiers, although he had invented a new move, The Air Scooter. I think that also an Airbending-Master could make an Air-sphere. Aang once bended an Air Sphere without the Avatar State in The Swamp, however he was unable to stabalize it without the added power of the Avatar State. 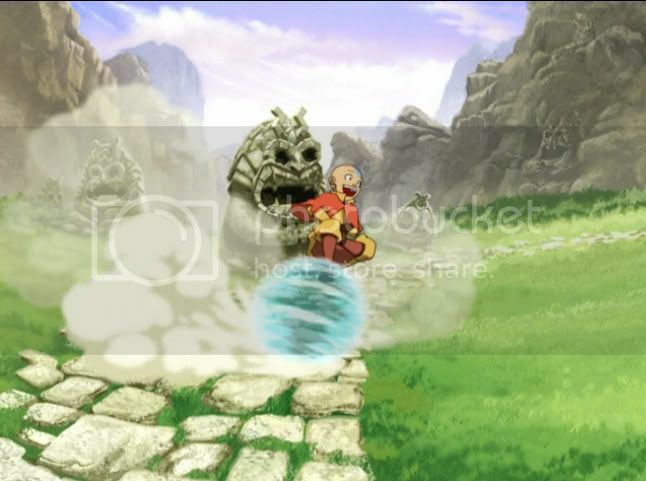 If it werent for the Tornado, the Air Sphere would have stayed but with the Avatar State even the Tornado would'nt have been able to break it. Just thought this info might help you guys decide. Too boring. I think the pics used right now are perfect. There's a saying: "If its not broken dont fix it". Same Discussion is on Multiple Pages. The Core/Real Discussion can be found on the Earthbending Talk Page. Please refrain from adding more posts to this section. Thank You. I dont like this one. Why not the one in which Avatar Yangchen is shown creating great gusts of wind or maybe the one in which Aang bends a Tornado in the Western Air Temple. And let me make this clear: I'm not at all opposed to the idea of changing this image if everyone thinks we should, I just want something clear and dynamic, like on the other bending pages, although I do like the image there is now. If it seems like I'm being zealous, I apologize, I'm just trying to work out a criteria with everybody. Well it is a form of Airbending just as Metalbending and Sandbending are forms of Earthbending. However Aang has demonstrated the technique at least once and at most twice. So what if it has not been used in combat? Airbenders prefer not to use their bending in combat anyways, remember? What about Sandbending? Besides it is slightly different. It bends the Sound. Very well. But I still think we should mention it even if it has been used to increase Aang's voice's volume only. Air Tackle would be better, after all the air is tackling Zuko as though a person would tackle another. 'Air Wake' is actually a good name for this move. I hope you don't think it has something to do with "waking up", right? Think about that expression: It was lying in his/her wake. It's kind of like what is left behind or traces of something that used to be there. In this case, it's the shape of Aang's body that is left behind or in Zuko's case, smacked into him. I believe the guy's asking for a detailed description of each tier. That's what 888 said. And you're right. There isn't that much detail on it. The wording you were insisting on that said Aang's attack missed ("...Though the attack missed its target...") is what I'm getting at. The test is not used only to find the reincarnated the Dalai Lama but any of the Lamas of that faith. There is only one Dalai Lama who is, to use a rough approximation, equivalent to the Pope. There are several Lamas who would be more like Cardinals. There is a documentary, Unmistaken Child wherein Lama Geshe Konchog dies and his disciple, Tenzin Zopa, undertakes the task of finding his reincarnation. An astrologer was consulted so the search was not entirely blind but still, he was a year and a half traveling around Nepal and northern India with a handful of rosaries, one belonging to his master. Finally in Tsum Valley he came to a village that was signicant because Konchong had spent some years in his youth meditating in a cave above the village. There was a boy there the right age, the clues the astrologer had given fit, and he chose the Lama's rosary when presented a choice. His parents commented that even as a toddler -- he was three when discovered -- he wanted to be taken up the slope to the cave. Zopa consulted with the Lama who was in charge of the region. He agreed the boy warranted further testing so he and his parents traveled to Kathmandu where he was presented to three or four Lamas. They questioned him further then tested him with four each of three different items, bells, rods, and rosaries, used in their rituals. By now he was four so he could talk reasonably well and each time he chose the ones Konchog had used. A letter was sent to the Dalai Lama in India saying the Lamas agreed the reincarnation had been found. The reply was positive so off the kid -- with his parents -- went to be presented to the Dalai. Further testing, not shown, was done and he agreed the child was the embodiment of Konchog. The parents were then asked if they wanted to give up their son to be raised by the monastary. They agreed, but there was a heart-wrenching scene where his mother, quite proud of the direction her son's life was taking, was also sad that she would not be seeing him much any more. I found the film fascinating. I think I have found a mistake. In Sozin's last testament, 風脅功師 (fēng xié gōng shī), which translates as "Wind-Coercing Master", doesn't exist. The exact text is 威脅, which means "threat", and 功師, which is presumably the end of the word "airbender". 風 isn't in the text, don't be confused with 威, they are different from each other. So I removed 風脅功師 from the article. Ummm, when Aang was rescuing Bumi, he froze the chain with his breath; was that air bending??? Proposal: Move "Spiritual Projection" to "Spirituality & Airbending"
We saw her get this ability in Book 2, & it was said to be related to her natural affinity for Spirits, not Airbending. Korra also projected her spirit. While she is "an airbender," she was said to be "bending the energy within herself." Iroh also projected his spirit, entering the spirit world. Not an airbender. Projecting your spirit has absolutely nothing to do with controlling air. Objectively, this is the power to project one's spirit. Calling it airbending is a subjective interpretation. All that has going for it is a selective reading of a single line as a "canon explanation," & it requires the complete assumption that there are "different kinds" of "spirit projection"--or that Iroh learned airbending at some point. the projection itself is non corporeal, and looks to be formed of energy. So, as for the above point, I don't see a contradiction. bending is not something that exists in the real world, so we cannot make judgements on what is required to perform a certain technique. We only go by what we are told, and we were told it is an airbender move. If it did not require airbending, then it would not have been referred to as that. How is it not an assumption that the line is even intended as exposition to begin with? How is not an assumption that "airbender move" automatically means "this technique is airbending"? How is it not an assumption that there are "different kinds" of spirit projection? Excuse my bluntness, but the issue that I have is that you are dismissing me as "just interpreting," implying that your position is proven, & that is simply not true. Why am I expected to find a character saying that it's not Airbending? When was it decided that this is a default position that needs to be disproved? After all, the 1 character quote that you have doesn't even literally say that that it's airbending in the 1st place. It seems ridiculous to ask me to either have an exact quote or concede that yours is "close enough" to count as proof. Again, when was it decided that "airbender move means airbending" is an assumption that it's okay to make, but "airbending requires controlling air" is not? Here's the thing; going into Spirit World by meditating is not astral projection. Yes their soul travels into there but it's not the same thing. Korra energybend during Harmonic Convergence, it's the wikia that says what she did during the HC was astral projection, we have no confirmation about it, if there is please let me know because i never seen a source, I would call that her energy form rather than soul. What Jinora did is probably (%99) Guru Laghima's technique. Jinora can walk around in the material world as a spirit. There is a difference between all of them. We don't know how did Iroh (or the Painted Lady) ended up in the Spirit World. I don't understand why did you make such an assumpation because clearly there is no link between them? Klainatta, do you actually know what "astral projection" means? Astral projection (or astral travel) is an interpretation of out-of-body experience (OBE) that assumes the existence of an "astral body" separate from the physical body and capable of travelling outside it. Astral projection or travel denotes the astral body leaving the physical body to travel in an astral plane. The idea of astral travel is rooted in common worldwide religious accounts of the afterlife in which the consciousness' or soul's journey or "ascent" is described in such terms as "an... out-of body experience, wherein the spiritual traveller leaves the physical body and travels in his/her subtle body (or dreambody or astral body) into ‘higher’ realms." It is frequently reported in association with dreams, drug experiences and forms of meditation. Before I answer that, I want to ask how you reconcile the theory that this "is airbending" with the inability to bend in the Spirit World. A response to the fact that "there's going to be an airbending subtechnique" is based on a flawed interpretation of Sifu Kisu's words in the 1st place would also be appreciated. Now that I have asked that question, you "can" ask that, but I think it's an entitled question. People here have dismissed me as "just speculating," claimed they have canon confirmation when they really don't, distorted my argument as "denying facts," & continue to do these things no matter how many times I explain that they're doing them, yet you expect me to be unfailingly polite & never say anything that could come across as a criticism of their logical skills or bias? I think the bigger issue is that you think you know better than anyone, or that no one else is using logic. Again, the only thing that matters is the word of the writers. It is their story and they shape it how they want. You can try to puff up your arguments, list as many fallacies as wiki will find for you, etc. But your drivel of a conclusion will not stand up to the truth. The one piece of logic and rationality you're missing is thus: the writers said it, therefore it is true until such a time arises where it is recanted, corrected, or elaborated upon. Though, I could say that another piece of logic you're missing is: We don't know the details, yet you presume to, postulating. Or do you not presume while stating such things as "The main difference is that I'm not suggesting that we say that it isn't airbending, just that we don't say anything more than what we know for certain--that it is a spirit-related move"? The thing is: we do know. It was point-blank, blatantly stated, clarified upon, etc. by Jinora, first and foremost, that is is a high level airbending technique. She then added, to which was the clarification, that there is a little spirit stuff mixed in. You simply have no foundation from which to stand on, and yes, I will continue to repeat myself until it is understood. However, I do think you can understand it; every human has the capacity. @Neo - I have explained in detail above my reasoning on why I think it should not be changed, and I would add that at no point did I justify my reasoning based on what Kisu had said. So that is irrelevant. It is clear that you do not agree with the reasoning myself and others have presented, but just because someone disagrees with you doesn't mean you can suddenly be disrespectful toward them. Similarly, just because you feel someone else has broken policy and been disrespectful, doesn't mean that you can do the same. Direct, personal attacks are not allowed in any circumstance, regardless of what the the person has said. You can call someone out if you feel that are being biased, provided you do so respectfully. @Taynio - I will repeat what I asked of Neo to you as well; please can you tone down your responses and ensure that you are not disrespectful toward other users. I will repeat, phrases such as "your drivel of a conclusion" are not helpful in having a constructive discussion. I apologize if it appeared I was being disrespectful, but that was not my intention. It is not rude, in my honest opinion, to use the word drivel, which means nonsense (or babbling, I suppose), if the words someone is speaking or typing is infact nonsense. It does qualify as drivel and no personal attack was made. That being said, I could start to see your point on it not being inherently constructive. But what other phrases does one use that implies something is nonsense without coming off as "disrespectful"? Granted I suppose just saying it's nonsense could work, but I thought it more prudent to use a more apt descriptor of how I felt. Either way, as I started the paragraph: I apologize and will conduct myself in a manner becoming. I didn't even think about flight as an Airbending subbending, we've been hearing Zaheer talk about it for a lot of his screentime, and presumably the Bisons are using Airbending to fly.